SA-2A - LA2A in 51X Format! So have been wondering for a long time if this one was possible. All the talk on the drawing board about tube circuits in 500/51X format and Peter's G9 got me motivated to investigate. After crunching the numbers and many discussions this week with engineer co-workers, I believe it's possible to do in dual bay 51X format and still stay within spec, without any chages to the original circuitry, the power is there, definately cutting it close, but doable. Would be possible to do in 500 format as well, but would require 3 bays to pull it off and stay within spec, don't know if that would be a better way to go, thinking maybe having this one be a DIY exclusive would be cool, opinions on that one are welcomed. To pull it off I'm going to need about a minimal 83% efficient flyback circuit for the HV, and 80% efficient buck converter for the heaters, but I believe both are doable. Just want to make sure if I pursue this that there is enough interest. Assuming there is I would like 1 or maybe 2 people to prototype along with me once design is completed. Will provide boards and metalwork for free, it just needs to be someone that: a) has an la2a for comparison purposes and b) has the time and finances to build one. Volker (silent arts), don't want to nominate you but if you're up for it would love you to be one of the people, your choice of course. Anyone else who is interested please email me. Working with the engineers on the flyback converter, should have done within a week, since the remainder is simply a copy and paste clone project (ie no real development involved) I expect this to move along rather quickly, already have the original circuit redone in my software. Really rough front panel arrangement, still a bunch of detail work to do, but you get the idea. Re: SA-2A - LA2A in 51X Format! for sure I'm in for testing. Real estate's not an issue, I'll figure out how to fit it all one way or the other. The LA3A was actually going to be my first 500 format project, Peter did his so I scrapped mine, but back then my original design had all 3 transformers and a full (non-gutted) T4B crammed into a single 1 bay slot, so point being there shouldn't be any issue with 2 slots for me to play with. I take back my previous statement, it's not possible to do in 500 format even with 3 bays, the +/-24V rails are what make the heater power possible, so 51X it definately is. Could someone confirm something for me though - I just want to verify that the main HV power buss is 220V, I'm basing all of my calculations off of that. I'm talking about after the 4.7K resistor connected to the transformer secondary (350V point). Looking on the original schematic, it looks like it says 219V at that point but it's hard to read. One thing I could really use some help with is the iron. I'm not really familiar with all the options people usually use, I know the sowders and edcors are popular, but think there's some lundhal and cinemag options also, as to which exact ones are compatable though I'm not sure. I'd like to give as many iron options as possible but since size is a constraint the provisions will have to be for something 51X friendly. This is cool. Looks like I'm going to need another 51x rack. One more thing (anyone that's familiar with the circuit) - one thing's not making sense about that 350V > 4.7K > 220V drop. The schematic lists that 4.7K as 2W. That's 130V drop across that resistor, so the current draw is about 28mA, but 28mA through a 4.7K resistor is almost 4 watts, so is that 2W on the schematic a typo I hope? ... so is that 2W on the schematic a typo I hope? Possibly the schematic say 350v >4.7k > 275v, which puts it at 1.2watts? Hard to read. Yea I know, at first I thought it said 279V but have seen someone on one of the LA2A threads say 219V and verified the unit was drawing 30mA across that resistor. Could someone with an LA2A please verify what the voltage is both before and after the 4.7K? The 350V before I think is pretty reliable as with a 500V CT transformer (250V x 1.4 = 350V) But without knowing what the voltage is after the resistor it's impossible for me to design the flyback booster correctly, and need to know for certain how much current this thing is pulling on the HV rail, although if the voltage after the resistor is higher than 220V it actually means less current demand and we're in even better shape than I thought, which means I'd be able to use an existing DC-DC isolation/booster method. Q. If you only have a lunchbox, how do you plan on testing this unit without the 24V rails in place? I hope you're going to add a stereo link option!!!! And provide some kits for forum members only, just like the SB4001??!?!?! please?!?! pretty please?! with vacuum tubes and carnhill transformers on top? lots of people have built the d-la2a with the sowters and the edcors. neither have much similarity with the original iron. i would definitely say to include an option for the edcors since they are so inexpensive and work okay. lundahls are great transformers, and compact, but pretty expensive. What exactly is that retro thing anyways? Has anyone tried one? Don't see any signs of a power boost so guessing they're running the plates at low voltage. And assuming minimal 150mA draw at 12V, there wouldn't be enough power in a two bay 500 module unless you went with some kind of buck converter, but even then you'd be cutting it really close. Or possibly they're under voltaging the heaters. Curious. If anyone has any output recommendations from either cinemag or Jensen, would be appreciated, just so I can attempt to make mounting provisions for them. I didn't start digging on thier sites for any equivalents to the edcors/sowters yet. I can't say which ones I'll be able to accommodate yet until I get everything modeled and start playing 3D chess, but I know the Edcors and sowters are popular so definately would like to make provisions for both of them. Do the edcors have screw holes in the body so that the brackets could be removed? I like the front panel vent holes on the Retro module. Cool idea. Looks like some very tight tolerances with the metal around that meter. Yea does look neat. Wonder why they cut it so close around the meter, doesn't look like there's any reason. Jeff, maybe you know, what's the story with the 48V rail? Is that exclusively for phantom power, or is there a 130mA limit on that rail as well? Always assumed it was off limits to use for anything but just wanted to verify that. 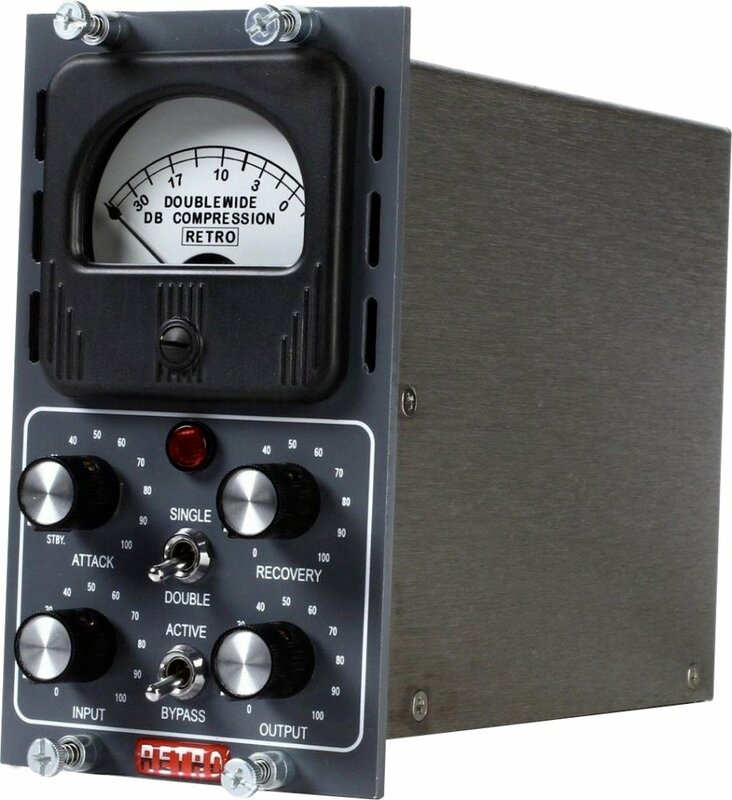 the sowter 1010 is larger, similar in size to a neve output transformer or the 1176 5002 output. the edcor wsm series in those values are made to order, so you could probably get them with no channel frame bracket and leads for a few bucks extra. the lams do have the holes, but they might not be clear of varnish unless you ask for that. physically, these would be the smallest output transformers, but on the larger size as an input. the cinemag CM-2511 with the primaries in series is a 600ohm to 15k input. a very nice transformer, that mike knows from his la3a. the 2622 with the primaries in series is a 600ohm to 10k input. also a good possibility. you can do a 1:1 input, ala the jensen mod, but a stepup is appropriate. the 1:10 of the original is probably no longer a good fit for most setups, but 1:5 on down to 1:1 is all fine. the VPR spec for the 48V rail is only 5mA. not worth using for anything other than phantom. fwiw, the last t4b that i got from drip was in this squat, coppery metal case instead of the big old plastic job they used to use. About half as tall. Maybe that could help in the space department?